"The trainer has been the best mentor. She has been very patient with helping us in overcoming our difficulties in the teaching and learning. Honing the soft skills and personality development being the main focus has helped me a lot. She made us feel free to ask of her help anytime post training as well. We keep in touch and seek guidance whenever we need it. " 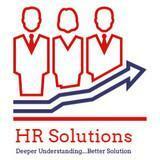 HR Solutions conducts classes in Soft Skills Training. It is located in Navi Mumbai, Mumbai. It takes Regular Classes- at the Institute. It has got 1 reviews till now with 100% positive feedback.